We're a very suggestible species. We are social creatures who need to fit in with our families and neighbours. We're expert at reading facial expressions and working out what other people think about us. Our reputation is important to us and without it we lose social status. Some people are bad at the social status game and others are excellent. Some people are good at taking social direction and others will bend the rules if they think they won't be caught. Mix in religion and a hotline to heaven and the situation of social influence can become more complex and interesting. There is a healing grave in Old Kilcorney graveyard in N Cork. It is the grave of a Fr. John O'Mullane who died in 1891. Fr O'Mullane was apparently a complex individual. I'm told he ran foul of the Catholic hierarchy and became a priest of the people. 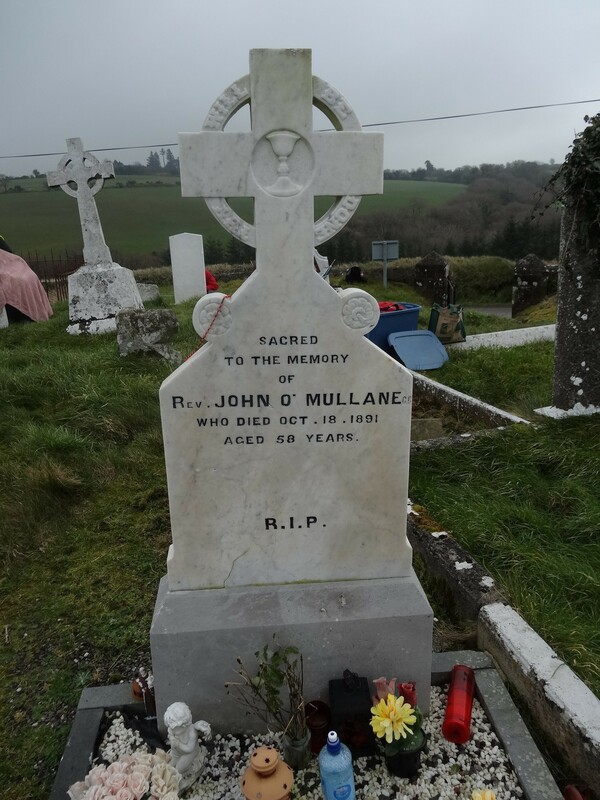 To this day there is a strong devotion to Fr O'Mullane in Kilcorney, and his grave is beautifully attended and on Good Friday is visited and prayed at looking for the intercession of the priest. When we were surveying this graveyard I asked some of the men on the team what kind of cures Fr O'Mullane could do and they said just general cures. When I asked the women they said 'oh drink, mostly drink!'. Fr O'Mullane himself may have liked a drink. If he was one of the O'Mullane's of N Cork then his family were high status; being dispossessed in Cromwellian times they recovered some of their estates and one of the girls, Catherine O'Mullane, married into a Co. Kerry family and was Daniel O'Connell's mother. But we haven't nailed down if Fr John was one of those Mullane's yet. Fr. O'Mullane was a priest to the ordinary people of N Cork and they cared for him as his stock with the Catholic hierarchy, the bishop I presume, got lower and lower. Anyway, the poor man died and was buried in Kilcorney by accident rather than by design. The funeral journey was interrupted and Kilcorney became his final resting place. And since then people in N Cork have been visiting the grave and believe strongly in the healing power of Fr O'Mullane. I thought at first people sought his help when drink was affecting a family but since the survey I heard an amazing story about Fr O'Mullane. I was surveying a nearby graveyard soon after Kilcorney and a woman turned up for the survey. We worked together quietly for about an hour. She was younger than me and after a while of numbering headstones and chatting about local surnames this woman told me a story. She had been at death's door a couple of years earlier; in Cork University Hospital. The doctors had told her husband she had a couple of days left. Her husband went to Fr O'Mullane's grave and prayed. Now, I'm a scientist; I believe in the scientific method. I have read about the suggestibility of the human mind, the role of placebo in folk medicine and modern medicine. I don't know the full story of that woman; but she made a big impression on me. She was calm, good to work with; she wasn't madly religious. But that happened to her. There is something interesting going on with these healing graves - the power of a local caring 'saint', a defrocked priest, a social agitator. If the local people take to a priest like Fr O'Mullane then a lot of positive thinking takes place. Fr O'Mullane appears to have been from a high status family; his status increased when he joined the priesthood. But he took to drink, for why, or how, I don't know, and his status should have sunk. But in his fall his humanity was revealed and the good people of N Cork took him to their hearts, in life and afterlife. Faith can move mountains but placebos can't cure illnesses. But this lady was at death's door. The power of this cure is that she did not know her husband had prayed at the grave. He prayed, she got better. Causal? Maybe placebos can't cure illnesses but maybe they influence our minds, make our attitudes more positive. This letter by Prof Stephen Jay Gould touches on some of these issues from a personal and scientific perspective.